DreamzIoTBlog IoT Lifestyle TechnologyA Happier Thanksgiving Thursday Powered by IoT! America’s second most favourite holiday after Christmas is almost around the corner and it’s the time to plan the perfect family weekend. Falling on 22nd of November this year, Thanksgiving Day has a string of traditions attached to it, most of which are constant for families throughout the country. Along with feasting on the perfect roasted turkey, enjoying a football game together with family, and expressing gratitude to one another, Thanksgiving has emerged as another popular occasion for shopping. The fun gets doubled as an exciting Black Friday sale follows Thanksgiving across all major stores with the best deals of the year! If we talk about shopping, this year, it is all about bringing home something extraordinary. IoT gadgets are leaving their mark in home appliances and lifestyle products as advanced technologies are altering the fabric of everyday lives. Simply put, IoT, short for the Internet of Things, refers to a brimming network of Internet-connected objects that can collect and exchange data within themselves. Almost every electronic device we possess is a potential IoT device. 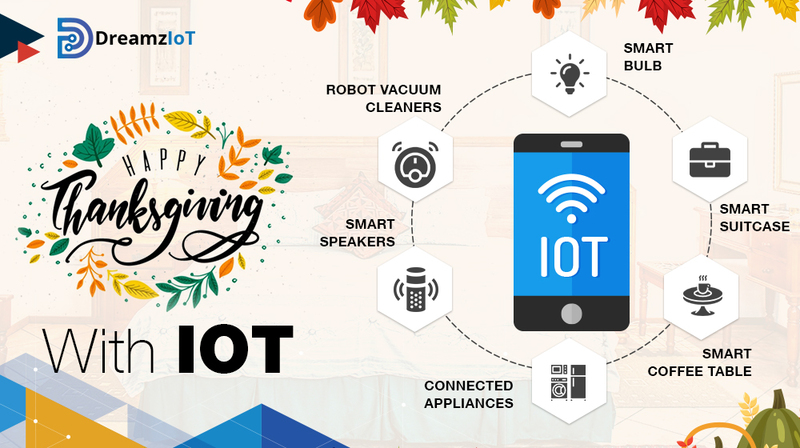 IoT: Something to be thankful for! Even with the extra help, one might receive from all the family members lending a hand, running things around the house, especially when you’re the host, tends to get overwhelming on days such as these. Modern appliances and gadgets responsible for bringing about a revolution in our kitchens and living rooms are now taking a big leap, all thanks to IoT. As technology permeates more and more product categories – from smart light switches to smart IoT Beer bottles – shoppers keep their eyes open for intelligent products that are efficient, convenient, and simply fun to have. Cooking a big lunch is the most enjoyable and the most exhausting part of any holiday. The art of getting a perfect temperature to cook a killer steak can be made easier with the Anova Precision Cooker. A pioneer in sous vide cooking, this Bluetooth and Wi-Fi enabled pressure cooker lets you cook from a distance as it maintains the vitals inside the cooker. And if you are big on trying out new recipes, the Drop recipe app will help you follow new recipes by connecting to the smart appliances already present in your kitchen. This app makes discovering and customizing new recipes easy as a breeze. Launched earlier this year, the LG InstaView ThinQ is the smart refrigerator of your dreams. With built-in Alexa to dictate recipes and help you add groceries to the shopping list, this fridge has a 29-inch screen that turns transparent with just a tap! A camera embedded inside the fridge lets you check the contents of the fridge on your smartphone. Connect this device to the other LG ThinQ devices that you may have for a truly connected experience. A widely known name in the category of IoT security devices is Nest Cam, a super HD surveillance camera for your home with a dedicated app and a speaker to help you stay present in your home even when you are away. This smart camera comes with a host of features, the most celebrated one being the photo alerts it sends to the homeowner just as any suspicious activity is noticed. Easily access a time-lapse video of the whole day with a few clicks from anywhere. Another product that is catching up fast is the SkyBell, a smart video doorbell to view, hear, and talk to anyone standing on your door. Access a live HD video via the app on your smartphone and get alerts even when the visitor does not ring your bell. Packed with a motion sensor and a night sensor, this product has partnered up with the leading security companies to fool-proof your homes. Our speakers do more than playing music and our remotes do more than just switching channels. Sonos offers a connected home speaker with fantastic sound quality and connectivity over Wi-Fi so that music continues playing even when you are using your phone to make a call. A universal touchscreen remote control compatible with a thousand plus devices is exactly what you need if you own a variety of entertainment gadgets in your living room. Lauded f0r its super easy controls and easy set-up, this intelligent package lets you search for programs on the remote itself. Invoxia Triby is a portable speaker with Alexa voice support that you can use to play music, listen to the news, leave messages for your family or record voice memos and control your home devices. It manages to get a lot many things done for its small size. On the other hand, Samsung is pulling all its smart devices closer by connecting them with SmartThings app on its Smart TV. Your Samsung washing machine, air conditioner, and refrigerator – all can be connected to the Smart TV. Control any gadget around your house using the TV or your Samsung Galaxy phone. A vast majority of smartphone owners are upgrading their products to bring in an IoT enabled variant every time they shop. We are looking forward to a closely knitted web of everyday devices which can draw conclusions and initiate subsequent actions hence reducing the conscious effort that goes into doing small repetitive tasks. We can soon expect our appliances to call for help when they’re about the break-down, ridding us of maintenance troubles. Managing all these different IoT devices which come with their own different apps and commands can get a bit overwhelming and frustrating as multiple apps take up a significant chunk of your phone’s memory. An easier way to operate the various IoT devices in your home is to connect them to a common app which acts as a command centre for your smart home. The DreamzIoT app is a blockchain protected IoT app which can help you centralize all the functions of all the different devices into just one app to help you exchange data among people, devices, and apps. It’s easy to connect to and comes in the form of a lightweight Progressive Web App with a host of convenient features so you can brew the morning coffee, open the garage door, and control the lighting in your room with just a single app. As families crave more quality time together with their loved ones, the demand and the applications for connected devices is seen growing steadily. And to our joy, tech companies are delivering innovative solutions almost every day to transform our lives only by improving them bit by bit. A Happy Thanksgiving awaits you!